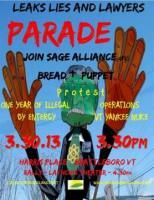 Bread and Puppet Theater and the SAGE Alliance will join forces to mark one year of illegal operation by Entergy Nuclear Vermont Yankee on Saturday, 3/30/13 at 3:30pm, with a parade through the streets of Brattleboro and a rally at the Latchis Theater. The state of Vermont’s original operating license for Yankee expired on March 21, 2012. In blatant defiance of Vermont state law and the will of the people, Entergy continues to operate Vermont Yankee; generating additional radioactive waste, polluting the Connecticut River with thermal waste, and barraging the state of Vermont with lawsuits. It has been one year of waste. In further disregard to the people and the state of Vermont, Entergy is in the process of refueling the crumbling Vermont Yankee reactor for another 18 months of operation. That means more waste in the overstuffed fuel pool. Since refueling began, a panel blew out as the result of three system failures, and two feet of water flooded an electric switchgear room. The state is formally questioning the NRC’s re-licensing. The people are not standing idly by. We will not let Entergy’s high-priced lawyers decide our energy future, nor a captive regulator, the NRC, to rubber stamp our safety. The people will tip the scales. floats, banners and bands, to the Latchis Theatre (50 Main St.). Rally will begin in the main theatre at 4:30pm for a program of speakers, skits and music. Chordz will lead a sing-a-long of “The Twelve Lies of Entergy.” The skit, penned by Chad Simmons of the Safe nd Green Campaign, will lampoon the four law firms hired by Entergy to defend the corporation from the people of Vermont.